Grit is a term used to describe various small solid particles that accumulate in the Influent stream entering a wastewater treatment plant. Grit is composed of small stones, sand, road cinders, gravel and similar materials. It is normally removed during the first stage of treatment and it is very abrasive. Due to the small particle size of grit, it can easily work its way past valve packing into seals and seats, and behind balls and plugs. It scores sealing surfaces of metal valves, creating leak paths. Most seating arrangements cannot close upon entrapped grit, again allowing a leak path. Red Valve Control Pinch Valves are found in thousands of de-grit chambers because they do not suffer these common problems with typical ball or plug valves. Rather than using an expensive metal alloy for abrasion resistance, Red Valve Control Pinch Valves have resilient rubber sleeves to absorb the impact of grit particles and bounce back to shape. The sleeve is full-ported, just like a piece of pipe, and is the only wetted part of the valve. This eliminates all packing and seals entirely. The flexible, yet rugged, rubber surface of the sleeve allows it to seal tightly around entrapped debris. Aerated grit tank designs have been utilized for the last 100 years, but have never been validated in terms of performance optimization. With the availability of computerized evaluations, primarily computation fluid dynamics (CFD) programs, these older designs have been evaluated for enhancement of performance. Tideflex® has incorporated these enhancements into their system designs and recommendations, resulting in performance increases of at least 20%. Tideflex® Engineers will determine the quantity of mixing zones required within the process. An evaluation should be performed for optimal operation to address storm surge capacity system needs. 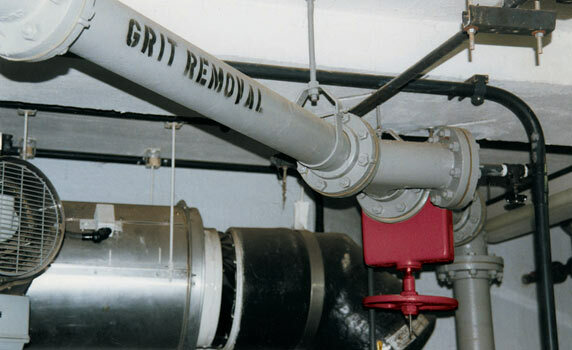 Grit removal systems should also provide a means for washing the biomass from the grit. This is achieved in the highrate mixing zones at the beginning of the process. The mixing zone’s energy requirements are decreased longitudinally through the grit tank for removal of various particle diameters.